Common balcony overlooking Main St. 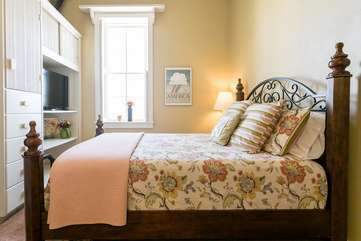 The back suite (Suite 3) has two bedrooms, each with queen beds. Comfy overstuffed chairs offer a place to relax in each bedroom along with flat screen televisions. A large bath accompanies this suite and offers a large soaking tub (no shower) and long counter. The suite's bedrooms and bathroom are private. However, both the front and rear balconies, living rooms, dining room, and kitchen are common and shared with the other two suites on the property. KITCHEN - Limited kitchen privileges; guests are welcome to make a pot of coffee and enjoy a cup of tea in the morning.